RSVP: Free to attend, registration required to secure a spot (limited space available). Regiser here, email info@cusbdc.org, or call 217-378-8535. All materials will be provided. There was an especially strong increase on the Asia-to-U.S. East Coast trade between the September reporting periods in 2015 and 2016, which likely was fueled by the Panama Canal’s third set of locks opening in June 2016, allowing the canal to handle vessels of over 14,000 TEUs. Prior to the expansion, the waterway could only handle vessels of up to around 5,000 TEUs. Source: Desormeaux, Hailey. “Shippers Leveraging America’s Inland Ports.” Full Stories – Caption as the Content – ASD Version | FullASD | American Shipper, 26 Oct. 2018, www.americanshipper.com/main/fullasd/shippers-leveraging-americas-inland-ports-72779.aspx?utm_source=AS%2BDaily%2BNewsletter&utm_campaign=a5697d835d-EMAIL_CAMPAIGN_2018_10_26_05_09&utm_medium=email&utm_term=0_485fa13138-a5697d835d-62904497. While traditional big city freight hubs grapple with congestion, a new crop of rural inland ports is springing up as shippers look for efficiencies. When people think of intermodal, Chicago often comes to mind. After all, the Windy City is the nation’s busiest rail freight gateway and the third-largest intermodal container/trailer port in the world, following Singapore and Hong Kong, according to the Illinois Department of Transportation. Many shippers routing their freight through Chicago face significant congestion, myriad tolls and other ancillary expenses. However, there’s an alternative to this traditional freight transportation hub emerging about 160 miles southwest at Decatur, Ill.
Decatur’s Midwest Inland Port features an intermodal ramp; direct access to Class I railroads CSX, Canadian National and Norfolk Southern; toll-free access to Interstates 72, 55, 74, and 57 and U.S. Highway 51; and an airport. Although the railroads and airport have been operating in Decatur a long time, grain producer and shipper ADM built an intermodal ramp there five years ago and opened it to other companies’ freight in 2015, Nicole Bateman, executive director of the Midwest Inland Port, told American Shipper. The port would not divulge total freight volumes due to its affiliation with ADM, which keeps its volumes through the Decatur hub confidential. However, Bateman said third-party volumes on the intermodal ramp grew 20 percent in 2016 and another 20 percent last year. The port is seeing a combination of existing customer volume increases, as well as new customer development, she said. Users of the Midwest Inland Port also have experienced savings in freight transportation costs and significant reduction in transit times, Bateman said. While Chicago may have trucks, it does not have the chassis, and that is where the issue comes into play for many of the region’s shippers, Bateman explained, adding that Decatur has the chassis, trucks and quick turn times. Instead of sitting at a ramp in Chicago, where the average wait time could be an hour and a half to two hours, or five hours at peak time, the average wait time at ADM’s intermodal ramp in Decatur is 24 minutes, and 57 minutes at peak time, she explained. Ryan McCrady, president of the economic development corporation of Decatur and Macon County, told American Shipper businesses of all sizes are attracted to the Midwest Inland Port, adding that even companies not shipping full train loads can use the facility and its assets. He explained that the inland port is a good option for shipments where Chicago is not the final destination. However, he said Decatur is in no position to compete with Chicago, but rather to complement it. T/CCI Manufacturing, a maker of heavy-duty truck compressors, has used the Midwest Inland Port for the past two years, said Kara Demirjian-Huss, the company’s global marketing director. She noted the company has a plant in Ningbo, China, which ships its containers from Shanghai to Prince Rupert, Canada. The containers are then placed on Canadian National trains en route to Decatur. Prior to using the Midwest Inland Port, T/CCI’s containers were shipped from Shanghai to Los Angeles, where they were transported by rail to Joliet, Ill., and then trucked another 180 miles south to Decatur, Demirjian-Huss said. T/CCI’s products are heavy, and the prior route required the company to use 20-foot containers. However, this new route with CN allows the company’s products to be transported in 40-foot containers, resulting in substantial cost savings. T/CCI estimates that it saves between $400,000 and $500,000 annually by using the Midwest Inland Port, said Dennis Flaherty, vice president of global operations at T/CCI. As the company expands its use of the Decatur rail hub, it expects those transportation cost savings to rise, he added. Rural King, a farm and home store based 40 miles southeast of Decatur in Mattoon, Ill., also relies on the Midwest Inland Port. In an interview, Alex Melvin, CEO of Rural King, said prior to using the Midwest Inland Port, his company relied heavily on Chicago, which was a mess. He said the Decatur operation provides Rural King with much better service. Rural King relies on the inland port for some imports, which are railed to Decatur from Canada and Los Angeles. The company picks up those goods with its own trucks and takes them to its distribution center at Mattoon. Overall, Rural King has about 2,000 containers per year now coming to the Midwest Inland Port. Melvin said the benefits of using the Midwest Inland Port are that Rural King is able to keep less on-hand inventory because it’s able to receive its goods quicker. Rural King also has lowered its operations costs by not relying on trucks coming from Chicago. 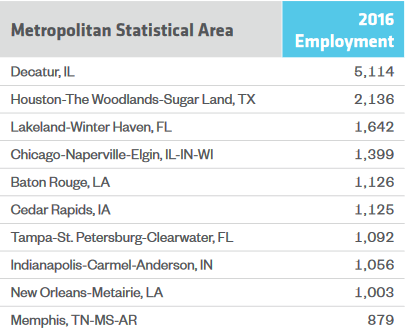 While traditional big city freight hubs continue to grapple with congestion, a new crop of rural inland ports, like Decatur, will inevitably spring up in the coming years as the nation’s shippers increasingly look to them for efficiencies. Source: Desormeaux, Hailey. “On the Surface: Chicago Bypass.” American Shipper, 8 May 2018, www.americanshipper.com/main/fullasd/on-the-surface-chicago-bypass-71286.aspx. A $50,000 contribution from Ameren Illinois will aid leaders of the Midwest Inland Port in attracting new, job-creating investment to the freight transportation hub. The commitment was announced at a March 20th luncheon organized by the Economic Development Corporation of Decatur – Macon County to brief area leaders on recent achievements of the EDC and advancement of the two initiatives it oversees, the Midwest Inland Port and the Limitless Decatur & Macon County community marketing campaign. The Midwest Inland Port is the strategic development of Decatur as Illinois’ designated downstate freight transportation hub with a focus on broad-based economic development throughout the central Illinois region and on relieving rail and highway congestion in Chicago. Pate outlined a handful of projects Ameren Illinois is undertaking to modernize its electric and natural gas energy delivery system and boost capacity to accommodate future growth in the community. Over the last six years, the company has created more than 800 jobs throughout its service territory in central and southern Illinois. The organizations that comprise the Midwest Inland Port Strategic Development Coalition represent a combination of global, national, regional and local perspectives and capabilities that are critical to realizing the full potential of the Midwest Inland Port development. In addition to Ameren Illinois, members of the Coalition include ADM, CN Railroad, Decatur Memorial Hospital, Clayco, OmniTRAX, and Illinois Department of Commerce and Economic Opportunity.